The Second World War stimulated an important advance in aircraft gun armament. The fighters of most combatant nations began the war with a few rifle­calibre machine-guns (RCMGs) of 7.5-8 mm calibre, but, by the end of the conflict, cannon of 20 mm or greater calibre were standard. The one exception was the USA, which relied overwhelmingly on the 12.7 mm (0.50 inch) M2 Browning heavy machine-gun (HMG). Students of armament history continue to argue: why did this happen, and were the Americans right? In 1939 the RAF's new Spitfire and Hurricane fighters were remarkable for their heavy battery of eight wing-mounted 0.303 inch (7.7 mm) RCMGs; twice as powerful as that of any other major fighter. In contrast, Germany's Luftwaffe had been watching the French use of engine-mounted cannon. In 1932 this resulted in a requirement for a fighter with two RCMGs or a single 20 mm cannon. The weapon considered was the large, very powerful but slow-firing Rheinmetall­Borsig MG C/30L, firing through the propeller hub. An initial experiment with a prototype Heinkel He 112 in the Spanish Civil War showed that this installation was unsatisfactory for aerial combat, though effective in ground attack. Germany then went to the opposite extreme and selected the small, low-velocity Swiss Oerlikon FF 20 mm cannon for development. A modified version, the MG-FF, was put into pro­duction by Ikaria Werke Berlin, and entered Luftwaffe service. Initial attempts to fit this as an engine gun ran into reliability problems, so the Messerschmitt Bf 109E-3 of 1939 carried two MG-FFs in the wings and a pair of 7.92 mm MG 17 guns synchronised to fire through the propeller disc. However, many Bf 109s were still armed with four RCMGs at the start of the war. The Battle of France caught the French with few fighters capable of dealing with the Bf 109s. Most French fighters carried a mixture of 20 mm cannon and RCMGs; the best was the Dewoitine D.520 with its four wing-mounted 7.5 mm MAC34 M39 MGs and the powerful, fast-firing Hispano-Suiza HS 404 moteur canon. The US-­built Curtiss Hawk H-75A, with four or six 7.5 mm FN-Browning guns, was too lightly armed. One lesson of early fighting was that the RAF fighters' battery of RCMGs was less effective than expected. Although the eight guns between them fired no fewer than 160 rounds per second (rps), they were initially adjusted to concentrate their fire at the long range of 365 m which led to the bullet strikes being spread across the target at shorter ranges. As self-sealing fuel tanks and armour became much more common during 1940, it proved necessary to concentrate fire at much closer ranges. The problem was that the small bullets fired by the RCMGs could not carry enough incendiary or explosive to guarantee success, and also had insufficient penetration to defeat armour reliably. A series of ground tests carried out by the British, firing at a redundant Bristol Blenheim from 180 m to the rear with various British and German guns and ammunition, revealed that the .303 incendiary B Mk VI bullets would set light to a Blenheim wing tank with only one hit in five; during the Battle only one or two of the eight guns were normally loaded with this ammunition. Other .303 and 7.92 mm incendiaries were only half as effective. Similarly, while both German and British steel-cored armour-piercing (AP) rounds could penetrate up to 12 mm of armour plate if fired directly at it from 180 m, most of the bullets were deflected or tumbled by first passing through the fuselage skin or structure. In consequence, only a quarter to a third of the bullets reached the Blenheim's 4 mm-thick armour plate at all, and very few penetrated it. The Luftwaffe relied more on their 20 mm MG­FF cannon, which had some interesting advantages and disadvantages. The guns were more than twice as heavy as the 7.92 mm MG 17 and fired only half as fast, at about 9 rps. The muzzle velocity was also lower, giving a different trajectory and time-to-target. Moreover, the 60­round capacity of its drum magazine limited the weapon to only about 7 secs of firing. However, the big shells weighed about 12 times as much as the RCMG bullets, and their high-explosive filling caused blast damage, as well as throwing high-velocity shell fragments around. In May 1940 the Bf 109E-4 entered service with the modified MG-FFM gun, adapted to fire the new Minengeschoss (mine shell) ammunition which had very thin walls and a doubled capacity for high explosive (HE) and/or incendiary. As a bonus the shells were lighter, permitting a higher muzzle velocity. The theory was that solid bullets or AP cannon shells relied on hitting the relatively small vital areas to have an effect, whereas an HE shell could cause serious damage regardless of where it struck. There is no doubt that this theory was correct: the Spitfires and Hurricanes would have had far more effect on the Luftwaffe's bombers had they been armed with four MG-FFM cannon, which would have weighed little more than their battery of RCMGs. The RAF had realised years before the war that the .303 MG might become inadequate as a primary aircraft gun, given the steady increase in speed, strength and toughness of aircraft. They considered, but rejected, .50 inch (I2.7 mm) guns as giving insufficient advantage over the .303. Instead, they sought a good 20 mm cannon, which they thought would be far more effective due to its explosive ammunition, and found one in the new French Hispano-Suiza HS.404. This was selected in the late 1930s, and specifications were written for a new fighter to carry it (the Westland Whirlwind), but problems in setting up UK factories meant that only a few guns were available for the Battle of Britain. To save time the Hispano was fitted to existing single-engined fighters for testing, and a squadron of Spitfire IBs saw service during the Battle. However, the gun was designed to be mounted on a massive engine block, and did not like being installed in a far more flexible wing. Moreover, the initial installation had the guns on their sides to bury the big drum magazines in the wings, and the Hispano did not like this at all. The result was such appalling unreliability, the guns frequently jamming after only one shot, that the squadron requested its old aeroplanes back. Throughout the Hispano's life, fine-tuning of installations was required to make it reliable in wing mountings. Guns mounted in the much more rigid fuselages of such aircraft as the Whirlwind, Beaufighter and Mosquito caused far fewer problems. Once working properly, the big cannon was a formidable weapon. Compared with the MG-FF it was slightly faster-firing at 10 rps, and its much bigger cartridge cases generated a considerably higher muzzle velocity, which improved both hit probability and penetration. While the Allies never introduced the Minengeschoss technology, so their shells only carried half the HE/Incendiary (HEI) load, the heavy Hispano shells' better penetration meant they could inflict considerable damage. The Hispano soon changed from a 60-round drum magazine to a belt feed giving much greater ammunition capacity (which the MG-FF never had, other than in an obscure nightfighter installation). The penalty was that the Hispano was almost twice as long as and double the weight of the German gun; unwelcome features for wing-mounted weapons. RAF fighters carried a mixture of HE or HEI and plain steel "ball" (practice) rounds (which had good penetration) until the emergence of the semi-armour piercing incendiary (SAPI) in 1942, after which the standard loading was 50/50 HEI and SAPI. The German cannon were not exclusively loaded with Minengeschoss, but used them mixed with older-type HEI-T shells (retained because, unlike the M-Geschoss, they could carry a tracer) and later some API rounds as well, in varying proportions. The Germans were not satisfied with the MG-FFM, which had been adopted as an interim measure pending the development of a purpose-designed cannon. This duly emerged as the Mauser MG 151, which gradually took over from 1941. Initially, the Mauser had been designed to use a high-velocity 15 mm cartridge, but it saw relatively little service in this form. Wartime experience led to the cartridge case being modified to accept the 20 mm shells from the MG-FFM, surrendering muzzle velocity and penetration in the interests of far greater destructive effect. The 15 mm version was available with HE shells, but they were considered too small. The resulting MG 151/20 was intermediate in size, weight and muzzle velocity between the MG-FFM and the Hispano, but was faster-firing at 12 rps. It was a superb design which the Americans tried to copy, producing some 300 guns in .60 inch (15.2 mm) calibre, designated T17, but they never adopted it. Later in the war, various new German guns emerged with calibres of up to 50 mm. 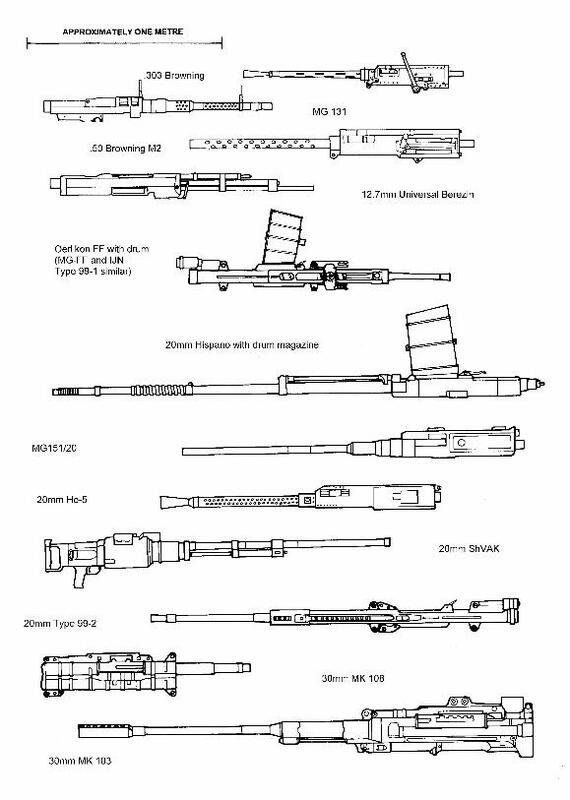 The most significant ones were the Rheinmetall-Borsig MG 131, MK 103 and MK 108. The MG 131 was a 13 mm HMG intended to replace the RCMGs in both fixed and movable mountings, and therefore kept as small and light as possible, making it the least powerful HMG to see service. The other guns were both in 30 mm calibre but otherwise very different. The MK 103 was a huge, high-velocity slow-firing gun, while the MK 108 fired much smaller, low-velocity cartridges at a very creditable 10 rps, and was only half the size and weight. Their use was really prompted by the difficulty the Luftwaffe was experiencing in shooting down USAAF B-17 bombers. Their 30 mm M-Geschoss HEI shells were highly effective, containing four times as much HE as the 20 mm version, and three or four hits with these could bring down a bomber, compared with 20 hits with 20 mm ammunition. In 1941 the USSR was attacked by Germany and thereby drawn into the wider conflict. As well as the very-fast-firing (30 rps) 7.62 mm ShKAS, it had in service an excellent HMG, the 12.7 mm Universal Berezin, and a 20 mm cannon, the ShVAK. The ShVAK had actually started life as a 12.7 mm gun. It weighed the same as the MG 151/20 and was slightly faster-firing, but the ammunition was less effective as the shells had only a small HE capacity. Towards the end of the war the Berezin was also altered to fire the same 20 mm ammunition as the ShVAK; at 25 kg the resulting B-20 was the lightest gun of this calibre to see service. The Soviet preference was to install all guns in the fuselage of their little fighters rather than in the wings, to concentrate firepower and make the aircraft more agile. Because this limited the number of guns, a relatively small number of aircraft was equipped with larger guns as engine cannon, including the powerful 23 mm VYa-23 and 37 mm NS-37. Because of the weight, recoil and relatively low rate of fire of these weapons, these were deemed suitable for expert pilots only. The end of 1941 also saw America and Japan enter the war. Their aircraft weapons were very different. America relied almost entirely on the Browning machine-gun, not just in .50 (12.7 mm) calibre, but, for the first couple of years, in .30 (7.62mm) as well. The Japanese army and navy air forces followed their own paths, the army steadily up-gunning from 7.7 mm through 12.7 mm machine-guns and later 20 mm cannon, with 30 mm and even larger guns seeing limited service by the end of the war. The navy started with a mixture of 7.7mm MGs and Type 99 (Oerlikon) 20 mm cannon and continued to rely on this cannon (initially the low-velocity Type 99-1, later the more powerful Type 99-2), although it did make some use of HMGs and was also introducing 30 mm guns by the end of the war. As in Germany, the destruction of American heavy bombers was a strong incentive for the development of weapons of 30 mm or larger calibre. The Americans did not intend to make such a commitment to the Browning MGs. Both before and during the war considerable efforts were made to secure alternative aircraft guns. Trials of foreign equipment resulted in the selection of the 20 mm Hispano-Suiza HS 404, large numbers being made. The Browning-designed 37 mm M4 cannon was also introduced, although used almost exclusively by the Bell P-39 and P-63. However, the standard fighter armament became a battery of six .50 inch Browning M2 HMGs. This has led to the often-expressed view that the .50 inch M2 was the best all-round fighter gun of the war. After all, the USAAF and US Navy fighters unquestionably came to dominate the skies in which they fought. If there had been a better gun, America would have used it. However, the truth is not quite as simple as that. There are two issues here; how good was the .50 M2 compared with other HMGs, and how effective was it compared with cannon? The most obvious comparator was the Soviet UB, which fired ammunition of virtually identical power. The UB weighed 25 kg, compared with the M2's 29 kg, but the Soviet gun fired at 17.5 rps, compared with around 13 for the M2. In terms of power- to-weight ratio the Berezin was therefore clearly superior. The Browning fared better against most other HMGs, as they all fired less-powerful ammunition, so the M2 enjoyed advantages in range and penetration. However, it had a slightly lower rate of fire than the German and Japanese guns (both around 15 rps), and was also bigger and heavier. The most powerful of all of the HMGs was the 15 mm MG 151, but this was heavier and slower-firing than the M2. Overall, therefore, the .50 M2 was not the best of the HMGs but was about average, with reasonable performance for its weight. How did HMGs compare with 20 mm cannon? The first problem is that the cannon varied hugely in size, weight and performance. The MG­FFM, Type 99-1 and B-20 were all lighter than the M2, but the first two were significantly worse in terms of muzzle velocity and rate of fire, although the B-20 matched the M2's rate of fire and was not far behind in velocity. The Japanese Ho-5 and Type 99-2 and the ShVAK and MG 151/20 were all somewhat heavier. Muzzle velocities and rates of fire were closer to the M2's but generally still not as good. The Hispano was significantly heavier and slower-firing until the British Mk V emerged near the war's end, matching the MG 151/20 in weight and rate of fire. The foregoing compares only the guns' efficiency; it takes no account of ammunition, the area in which the HMG loses most ground. The 20 mm cannon shells were not only two to three times heavier than HMG bullets, but their HEI contents greatly increased their effectiveness. Although HE ammunition was available for most HMGs, their small bullets severely limited the quantity of chemicals carried, so the Americans decided not to use them. Initially, the M2 used a mix of incendiary and AP bullets, with some tracers, but in 1944 the M8 API began to take over. Rather curiously, this was based on the Soviet B.32 API used in the Berezin. It is difficult to assess the effectiveness of different ammunition types, but various tests suggest that a typical World War Two-era HE or incendiary shell, with chemical contents forming about 10 per cent of total shell weight, was about twice as destructive as a plain steel shell of similar size and weight. This makes it clear that 20 mm cannon were considerably more destructive for a given total weight of armament than any HMG could hope to be. For example, the .50 M8 API contained less than one gram of incendiary, whereas the 20 mm Hispano SAPI achieved similar armour penetration but carried more than ten times as much incendiary material. This advantage was recognised by the US Navy. After comparing the .50 M2 and the 20 mm Hispano they estimated that the cannon was three times as effective. In other words, the typical RAF armament of four 20 mm cannon was twice as destructive as the USAAF's six .50 HMGs, for very little more weight. Proponents of the Browning HMG point to its excellent ballistics, which enhanced its range and hit probability. But the Hispano's muzzle velocity was very similar, and although the blunt-nosed shells were less aerodynamic the difference over typical air-combat ranges was not significant. The cannon's advantages are clearly shown in the decisions made as a result of combat experience by air forces with a choice of good HMGs and cannon. We have already seen how Germany preferred the 20 mm version of the MG 151 despite its poorer ballistics. In the 12.7 mm Berezin the Soviets had arguably the best HMG of the war, but they still preferred the heavier, slower-firing 20 mm ShVAK. Japan had several good HMGs available; the army's Ho-103, and the navy's 13 mm Type 3, a .50 Browning chambered for slightly larger-calibre ammunition, but they made increasing use of cannon. So why did the Americans not make more use of cannon, specifically the 20 mm Hispano they already had in mass production? There were two main reasons. One was certainly that the M2 was adequate for its purpose. In Western Europe the main adversaries were fighters, which were much easier to damage and shoot down than bombers. In the Pacific Theatre the Japanese aircraft were initially poorly protected and easy to shoot down. Later Japanese aircraft were better protected, but again these were usually fighters. If the Americans had faced the need to stop raids by heavy, well-protected bombers, it is likely that the HMG's shortcomings would have been starkly revealed. There was another reason, however, which explains why the US Navy, despite rating the cannon very highly and facing the need to deal with attacking bombers and kamikazes, fitted it to few aircraft. That was serious production prob­lems with the American Hispano, which gave it a reputation for unreliability. Despite production running well into six figures, the American Hispano failed to achieve an acceptable reliability standard for the duration of the war. To return to the original question, were the Americans right to rely so heavily on the .50 M2 when all other combatant nations had a clear preference for cannon of at least 20 mm calibre? The answer has to be yes. It was adequate for its purpose, and was the only satisfactory aircraft gun in production in the USA. It was very reliable (except where the installations created problems), was made in huge quantities, and the simplification of supply by comparison with the diversity of weapons used by the Axis powers gave a major logistical advantage. However, the Americans could get away with using a weapon so deficient in destructive power not only because of the nature of their opposition, but also because the size and engine power of their fighters enabled them to carry a battery of at least six guns, thus making up in quantity what they lacked in destructive quality. The advantages of the 20 mm Hispano M2 were not entirely ignored. It was carried by Lockheed P-38s, together with four .50 Brownings. It was also installed in nightfighters, which needed maximum firepower to convert a short firing opportunity into a kill. Four were installed in Northrop's P-61 Black Widow, and two could be mounted in a Grumman F6F-5N. The cannon's extra firepower was also appreciated for ground strafing. After the war the US Navy quickly changed over to the 20 mm cannon in its improved, faster-firing and more reliable M3 form, but the USAF stayed with the .50 M3 until the fighting in Korea demonstrated once and for all that the HMG had had its day. From the mid-1950s the USAF at last replaced the old Browning with 20 mm cannon, initially the M39 revolver and then the M61 rotary - just as most of the rest of the world was moving up to 30 mm!